An Edinburgh homeless charity is celebrating after receiving £500 of Scotmid vouchers through the convenience retailer’s community grant scheme. The grant will be used to provide ingredients for the charity’s weekly cooking groups. The Rock Trust works with young people between the ages of 16 – 25 who are homeless or at risk of becoming homeless across Edinburgh and the Lothians. This includes young people who are in transitions, leaving care or home and those involved in offending, alcohol or drug misuse. Amanda Donaldson, a fundraiser for The Rock Trust, said: “We would like to say a huge thank you to Scotmid for their kind support. The Rock Trust has always believed that homelessness was more than rooflessness and that young people need to learn social and practical skills to be active participating members of their community and society. 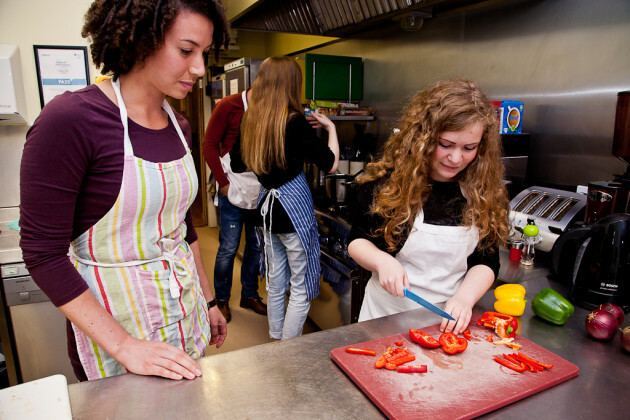 “One of the skills that we develop within our group work sessions is cooking, which build independence and confidence and are a valuable and enjoyed part of our program. The vouchers we have been awarded will go towards ingredients for these groups. Often the meals prepared are the only hot meals the young people will have. The Rock Trust’s role is to advise, educate and support young people, enabling them to build the personal skills and resources required to make a positive and healthy transition to adulthood, while avoiding or moving on from homelessness. For more information about the Rock Trust, visit www.rocktrust.org.